A cleft lip is a separation of the two sides of the lip. It usually looks like a gap in the skin of the upper lip. It is a birth defect. It is the most common birth defect of the head and face. It can happen on one side of the lip (unilateral cleft lip) or both sides of the lip (bilateral cleft lip). We do not know what causes cleft lip. 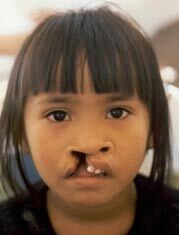 Everyone has a chance of getting a cleft lip. A cleft lip happens early in pregnancy. It usually happens 5 or 6 weeks after you become pregnant. It can usually be seen on an ultrasound. If it was not seen before birth, it will be noticed immediately after birth. No, it is a birth defect. There is very good treatment for a cleft lip. Doctors will also look at your child's hearing, speech, eating practices, teeth, and emotional health. The doctors may see your child for many years. This is to make sure his hearing, speech, eating, and self-esteem are doing well. A cleft lip is a gap in your child's upper lip. Twice as many boys are born with it than girls. A doctor may diagnose it before birth with an ultrasound, or after your baby is born. A cleft lip can be repaired with surgery. A team of doctors and professionals will see your child for many years. They want to make sure his hearing, speech, eating, and self-esteem are doing well.